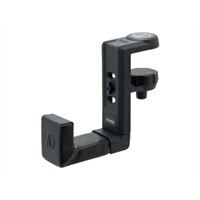 The AT-HPH300 headphone hanger is a convenient tool for safely storing your headphones in areas where space is limited. The hanger features an adjustable clamp that mounts securely to a shelf, desk or other surface up to 3.5 mm (1.4-inch) thick. The hanger rotates 360°, allowing you to store headphones unobtrusively under the desk or shelf, or have out and at the ready to quickly grab when needed. And with the hanger's soft leatherette pad, you never have to worry about your headphones getting scratched or damaged. A great space-saving solution.